CD-100 is a precision CD player and transport from the great value BasX range which can be used to play all standard (Red Book) audio CDs. 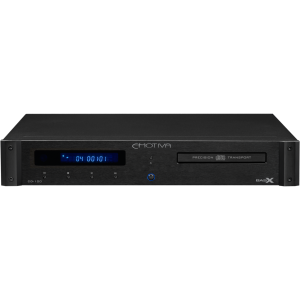 - Dimensions (WHD): 17" x 3.5" x 13"
Emotiva BasX CD-100 from Emotiva is a highly precise digital CD transport paired with a top quality digital-analogue-converter (DAC) in a convenient and stylish package. Emotiva ensures an audiophile listening experience by using advanced engineering techniques, high-quality construction, and the addition of a powerful laser in the player guarantees the audio quality, whether you wish to use the CD-100 as a transport or as a complete audio source component. The exterior faceplate of the CD-100 is constructed from solid aluminium with a steel chassis, that combines an elegant aesthetic with rugged reliability. The tray is for precision loading the disc with care. The CD-100 can be operated from the intuitive front panel or the full function remote control. 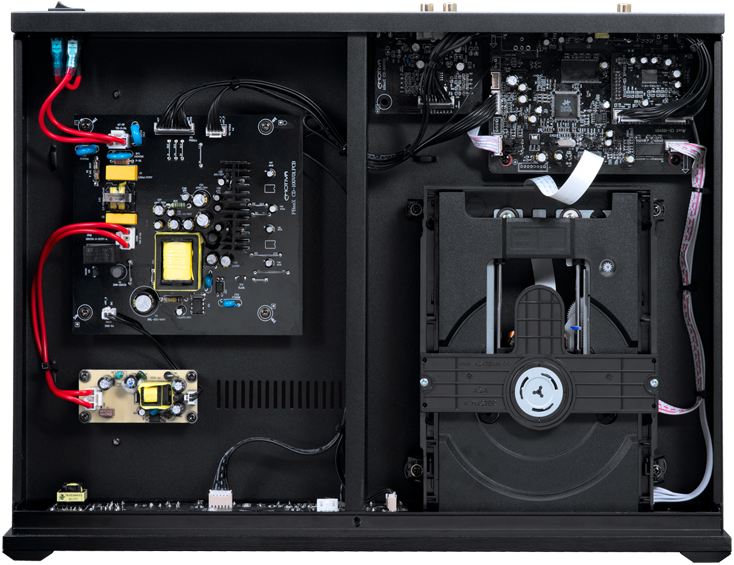 The internal layout of the CD-100 has been designed to provide extra shielding, with protection against vibration, interference, and jitter. The CD-100 also has an upgraded Digital-Analogue-Converter (DAC) which receives its power from the filtered multi-stage power supply, which is sophisticated to give you audiophile levels of sound. Irrespective of whether you use your BasX CD-100 as a precise bit-perfect transport or you can connect to the analogue output on the built-in advanced DAC to a preamplifier, and the CD-100 will elevate your CD listening experience to the next level. The BasX CD-100 delivers real audiophile levels of sound, the specifications of the CD player will confirm this. Such as the analogue outputs, that have a flat frequency response between 20 Hz and 20 kHz (+/- 0.35 dB), with a total harmonic distortion (THD) of less than 0.08%, and an IMD of less than 0.006%. The outputs on the CD-100 include Coaxial and Toslink optical S/PDIF for digital signals. The CD-100 is capable of playing regular CDs, and CD-R discs that have been recorded, including Red Book audio CDs, CDs with HDCD encoding, and discs with MP3 codec files. The BasX components are all reasonably priced and provide great sound quality, with practical features, to ensure audiophile levels of performance, within an elegantly simple design. You don’t need to be rich to afford them, and you don’t need to be an engineer to figure out how to use them. The components of BasX products have crafted and chosen to provide you with many years of reliable and trustworthy service, plus they all look great whether in your living room or on the rack. It is possible to build a complete audio system from the BasX series, or you could employ just one or two to improve your existing system. The CD-100 supports many audio formats, from standard CD's to hybrid SACDs, HDCDs, and MP3 files, on both regular CDs and computer-recorded discs (CD-R). The loading tray is reliable and precise to handle discs consistently and reliably. The laser is precise enabling it to read even damaged discs that other players would struggle with. For digital output, the CD-100 has Toslink optical and Coax S/PDIF outputs. Using the CD-100 as a transport, results in bit-perfect audio signals from the digital output on the transport connected to the input of your DAC or processor. Using the CD-100 as a complete Player, reveals superb analogue audio, that is a consequence of its built in DAC (Cirrus Logic CS4398 Advanced Multi-Bit Delta-Sigma). The display on the CD-100 is intuitive and highly visible using a blue VFD display, so you can understand what you are playing, even from a distance. The CD-100 has intuitive controls on the front panel with blue halo illumination, so operating the player without the remote control is simple and intuitive. Plus, the CD-100 includes a fully function remote control so you can operate the CD-100 without getting out of your chair. The power supply is advanced using multiple independent and well filtered linear power supplies for the analogue and digital circuits. The steel chassis is reinforced for reliability and isolating the mechanisms from unwanted vibrations. Also, the motorised CD tray for is designed fro years of smooth loading. The CD-100 can operate with either 115 VAC or 230 VAC at 50/60 Hz, which it automatically detects and configures so it is operating correctly according to your home voltage.